Large Capacity Dual Hose Manual Rewind Gear Crank Hose Reels 1/2"ID No Hose are designed for large capacity applications. They feature dual plumbing with two swivel inlets and two low profile outlets that compliment the open drum slot and provide a non-crimping, flat smooth hose wrap. The industry preferred one piece all welded “A” frame design adds rigidity and strength while the positive gear drive rewind assures consistent trouble-free performance. See table for specs. 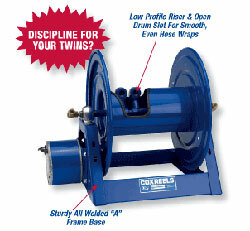 Available options are Top Rewind Assembly 4-way and Bottom Rewind Assembly 4-way.